Dubai, 22 December 2018: Global Village, the world’s leading multicultural Festival Park and the region’s first family destination for culture, shopping, and entertainment has announced a series of the biggest entertainment and cultural events and festivities, including seven fireworks shows, to ring in the New Year. The ideal destination for families celebrating New Year’s Eve 2019, Global Village will feature massive fireworks displays that will occur at the same time as the New Year is rung in at seven countries around the world. Under the theme “Explore, Experience, Enjoy. This Way!” Global Village musical fireworks displays will go live after the countdown to midnight will take place seven times, each time midnight strikes in one of the seven selected countries. Thousands of guests will participate in counting down the seconds till midnight, before the fireworks kick in, making it the biggest New Year’s eve celebrations in the UAE. At 8.00 pm UAE time, the festivities will begin with the countdown and an intense firework show in sync with the advent of the New Year in China. At 9.00 pm, they will herald the New Year in Thailand, at 10.00 pm it will be in line with Bangladesh, at 10.30 pm with India and at 11.00 pm with Pakistan. At 12 midnight in the UAE, a special and the biggest fireworks display of the season will mesmerize the guests and ring in the New Year here. At 1.00 am, the display will coincide with the New Year in Moscow, Russia. To round off the night, guests can enjoy some of the best shows and performances from the Global Village entertainment team. The entertainment schedule of the night includes one of the highlights shows of this season - the “Malevo” Argentinian show - performing directly after their successful participation in America’s Got Talent. Guests seeking thrill and adrenaline can enjoy the action-packed Superloop stunt show with the world’s first loop the loop stand in a stunt show. 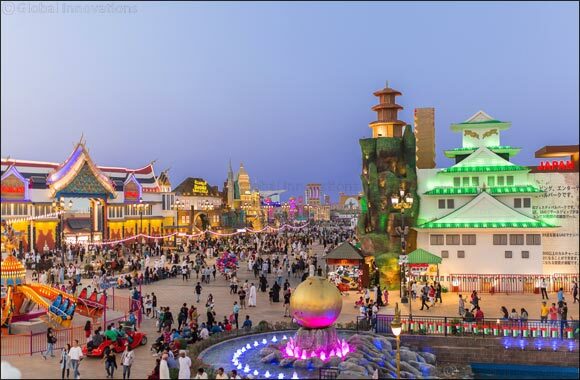 Young guests and kids can also enjoy their night at Global Village with a number of interactive workshops and their favorite character shows performed at the Main Stage as well as at the newly introduced and highly popular Kid’s Theatre. Global Village has introduced a special and limited edition New Year’s Eve Family Pack for the occasion that provides families with a value proposition like never before. It includes four entry tickets, one Carnaval card loaded with AED 100, two Cheeky Monkeys daycare coupons, one restaurant discount voucher with 15% off and one Car Pass A. The pack is being sold only at the Guest Care Centre next to the Gate of the World at Global Village, for a mere AED 249. Global Village will welcome all guests on Monday, December 31st instead of being a family day and will extend its working hours until 2am instead of midnight. NYE 2019 celebrations at Global Village are free to view and participate in as it is part of its entry ticket price of AED 15. Season 23 of Global Village will operate until 6th April 2019. It welcomes guests daily from 4:00 pm to 12:00 midnight, Saturday to Wednesday and from 4:00 pm to 1:00 am on Thursday, Friday and public holidays. Mondays are for Family and Ladies admission only.